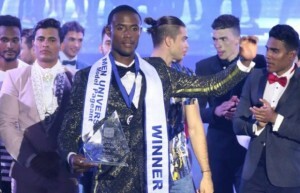 SANTO DOMINGO - La Novia del Atlantico was the destination host of the eleventh Men Universe Model Pageant 2018, where more than 40 countries participated, resulting in Anthony Clarinda from Curacao, who was also selected with the "Best Typical Costume and / or Fantasy, as the winner. Clarinda received the sash that credits him as Mister Universe 2018, by Kevin Montes from Puerto Rico, winner of the position in 2017. In this version of the contest the First Finalist fell to Uruguay, who also obtained the nomination "Best Body", while that, the Second Finalist is the representative of Venezuela. On a memorable night full of music by the most popular urban exponents throughout the country, the Puerto Plata Amphitheater was the ideal place to host the event, in which the Tunisian Republic, the Netherlands and the Philippines were selected as Third, Fourth and Fifth Finalists, respectively.